Mark your calendars! 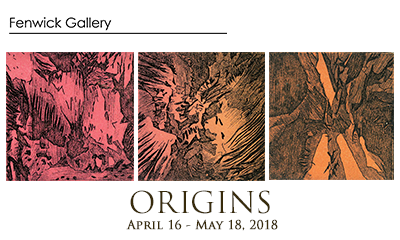 Opening on April 16, Origins is an exhibition from the Mason MFA Printmaking collective, ELEMENTS, and examines creation myths focusing on the genesis of man, the material world, and the role of divine beings. Learn more about Origins on our exhibitions page. 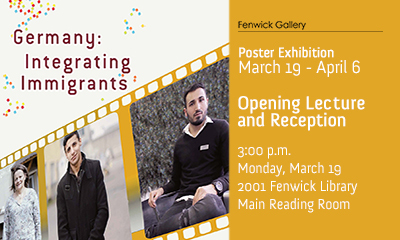 Fenwick Gallery is pleased to host a visiting poster exhibition, “Germany: Integrating Immigrants,” on display from Monday, March 19 through Friday, April 6. Developed by the German Embassy, this exhibition provides facts about immigration in Germany as well as stories about immigrants and refugees who came to Germany and made a positive difference. Learn more on our exhibitions page. Join us on Monday, March 19th at 3:00 p.m. for an opening lecture with Mr. Christian Heusermann, Chief of Staff to the German Ambassador of the German Embassy in Washington, D.C. A small reception will follow in Fenwick Gallery at 3:45 p.m. This event is co-organized by Dr. Natalia Dudnik, Term Assistant Professor of German Studies, and is co-sponsored by the Modern and Classical Languages Department at George Mason University and the Embassy of the Federal Republic of Germany. Deconstructing traditional writing systems and letter forms, artist Kate Fitzpatrick invents her own written language as meditation. The work unveils a realm of streaming consciousness, forming a mantra of the artist, while the structure of the page invites the viewer to search for the familiar and reflect on the unknown. On display now through March 16, 2018. 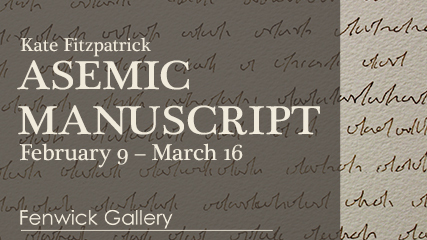 Join us on Wednesday, March 7 for an artist’s talk with Fitzpatrick and curator Jennifer Lillis. Learn more and see a full artist’s statement on our Exhibits page.